ORLANDO, Fla. — It didn’t come without a major struggle, but the Orlando Magic finally regained the winning feeling. Tobias Harris snapped a tie by hitting two free throws with 10.1 seconds to go, and the Magic kept the Boston Celtics from getting off a shot before the final horn in coming away with a 93-91 victory. 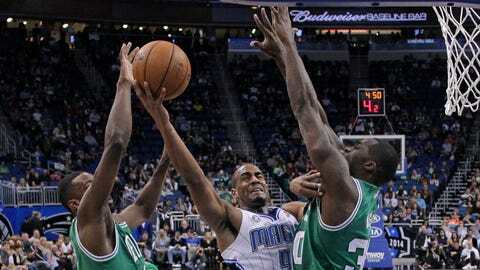 The Magic had not won since beating the Atlanta Hawks on Dec. 29. The victory broke a 10-game losing streak overall, as well as a 10-game streak to the Celtics dating back to January 2011. Harris was fouled by Kris Humphries when the two were going for a rebound after Jameer Nelson missed a potential go-ahead 3-pointer. The Magic went to the free-throw 36 times and made 29 attempts, making up in large part for a subpar shooting performance from the floor. The Magic took a 53-46 halftime lead but let it slip away in a third quarter during which they scored only 13 points and committed seven turnovers. Nikola Vucevic missed his seventh consecutive game due to a concussion he suffered Jan. 6 at Los Angeles. Coach Jacque Vaughn didn’t go very deep into his bench, with Kyle O’Quinn and E’Twaun Moore being the only non-starters to see action. O’Quinn turned in his third solid showing in the past week with 10 points and nine rebounds in 25 minutes. Rajon Rondo had six points, four assists and six rebounds in 21 minutes for the Celtics in his second game since tearing the ACL in his right knee last Jan. 25. He played the final 6:48 and gave Boston its last lead at 91-89 on a jump shot with 1:16 remaining. The Celtics got back into the game by going on a 13-0 run in the third quarter. Neither team led by more than three points over the final 12 minutes. Afflalo tied his career high in rebounds with 13 and also had 20 points and six assists. The Magic had been 0-12 this season without Vucevic. He missed four games last month and two earlier this month with a sprained left ankle. Tuesday night at Brooklyn, 7:30 p.m. (FOX Sports Florida).